Spring break is almost here, and summer will be here before we know it. 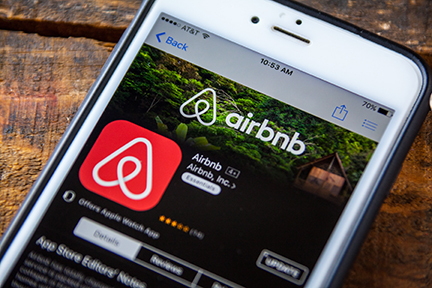 If you’re planning to stay in an Airbnb during spring break or while you’re taking a vacation this summer, you could have your most intimate and private moments videotaped, audio taped, or watched live by a total stranger. As professionals who routinely locate and remove hidden cameras and hidden audio devices from homes, businesses, cars, and even the occasional yacht or jet, you might be thinking that we’re simply looking for a way to get more people to worry and call us. This isn’t a scare tactic. It’s real life. Panasonic recently announced a new home security camera that is built into a floor lamp. Yes, you read that right. That seemingly harmless and aesthetically pleasing floor lamp in the bedroom or living room (or any other room) of your Airbnb may actually be a hidden camera. Oh, and unplugging it won’t help. It has a 90-minute battery back-up (AAA batteries). It can also record in the dark. Its wide angle lens makes it easy to surveil and record the activities of what’s happening…in HD. By the way, its motion sensor means that it will start recording as soon as it detects any sort of movement. It’s also affordable for most people. The early model is available for less than $300. HomeHawk also comes with an app for both iOS and Android as well as a built-in microphone. The Airbnb owner (or anyone with that app who has access to that specific lamp) can listen to everything that’s said in the room. While anyone could go and buy the Panasonic HomeHawk for their own home (and also hope they’re not violating the recording laws in their state), it’s important to note that there is a long history of Airbnb owners using hidden cameras to spy on the people using their home. Although Airbnb has terms and conditions that say the home owner must inform the renters of the camera and recording, we all know that probably doesn’t happen on a regular basis. Panasonic clearly did not go out of their way to make this hidden camera “hidden.” If you’re close to it, it’s fairly easy to spot (if you’re paying attention). Yet, not all hidden cameras are so easy to find inside of an Airbnb (or any residence or business). They can be tiny enough to fit under a television or piece of furniture. They can be disguised as wall chargers for cell phones. Sometimes, they are easy to spot if you know where to look. For instance, think about the Starbucks incidents involving hidden cameras. They were obviously cameras. They were just put in places a lot of people don’t think to check. When was the last time you walked into a public restroom (the kind where you lock the door behind you) and looked under the sink, baby changing station, or in the toilet? If you plan to stay in an Airbnb, be careful when you choose. Make sure that you know the signs of a hidden camera. Read the agreement carefully to see whether the host states that cameras are in use. If they are, consider whether that’s really a place you want to spend your time. If you think that there may be hidden cameras, audio bugs, or GPS devices being used against you in your home, office, or vehicle, call Spy Catchers at 1-800-373-8726 to schedule a professional sweep. Spy Catchers is a professional Technical Surveillance Countermeasures (TSCM) company serving customers across the United States and Internationally. Spy Catchers provides expert counterespionage, counter surveillance and electronic eavesdropping detection services to private individuals, businesses and government agencies. © By 2019 Spy Catchers LLC. All Rights Reserved.